Magical Urban Fantasy Reads: Do you want personalized signed books? Do you want personalized signed books? 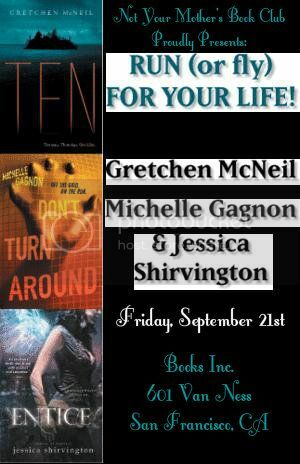 On Friday, I'm going to a book signing event, and I was planning on getting some books generically signed for giveaways! But then I thought, “What's even better than winning a signed book?” Actually winning a book that’s been personalized for the winner! And I'll throw in an ARC of Breathe by Sarah Crossan for this giveaway too! So enter now because there’s just over 2 days to enter to give me enough time to have your book personalized. US shipping only. Giveaway ends Thursday, September 20, 2012 11:59pm EST. The first winner will receive their first preference, the second winner will get their top preference that’s still available, and so forth. Total of 5 winners. Have fun! and thanks for the chance!!! You are too kind! Thank you so much! This was just way too sweet! This is a great giveaway. That is so sweet of you! Thanks a bunch..
That is such an awesome idea!!! :D Thanks for the FABULOUS giveaway! I love personalized books!!! :) thanks for the awesome giveaway! So excited for Ten! Have fun meeting these great authors! Ten, Possess, Breathe, Embrace and Entice. This looks like a fabulous event! I have read Possess but that's the only one so far. I would love to read the others too! Thanks for the giveaway! I really wish Gretchen McNeil was coming close to me for a signing because I would love to meet her! Have a great time at the signing though! Personalized book are always winners to me! :) Such an awesome giveaway! Thank you :D Have fun at your signing! What a great idea! I love signed books!!!! Ten looks awesome! I think my students would love to read it! What a wonderful selection! Thanks for being so generous! Thank you for the awesome giveaway!! Have fun at the signing! This is an awesome giveaway!!! Signings are always fun so have fun and enjoy yourself !! This is an awesome giveaway, I've never been to a book signing but I hear they are lots of fun. I hope you enjoy the event! thanks for this giveaway! :) - Len D.